By Shauna Irwin | October 14, 2013. 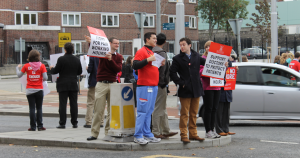 Over 100 campaigners paced quietly outside St James Hospital yesterday as part of the Irish Medical Organisation’s (IMO’s) strike to down scale junior doctors’ hours. 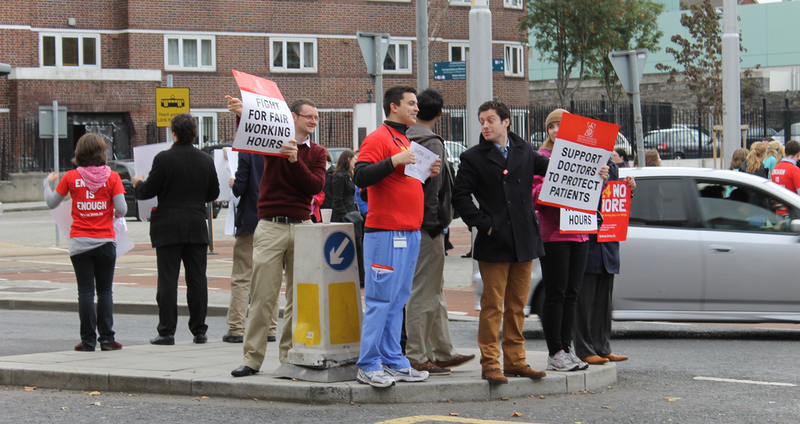 The Enough is Enough campaign aims to reduce the hours of non-consultant hospital doctors (NCHDs) to bring them in line with the European working time legal limit. The protesters held up posters that read ‘Enough is Enough’, ‘24 no more’ and ‘support doctors to protect patients’ while marching in a circle. Helpers were on hand to hand out tea and coffee to people who stood outside for the protest. Mr Considine said: “Patients deserve doctors who aren’t tired, who are fresh and who are alert.